Hillsboro has never had it easier. We are the Hillsboro garage storage experts here to assist you with your garage disorganization problems. Let us introduce you to the wide selection of garage storage systems we have to fit both your budget and your style. While your ski boots, bikes, and golf clubs are essential for having fun and making the most of your life in Hillsboro, they need to be stored in such a way that when you want them, you can easily get to them. After all, it’s no fun having to spend an hour sorting through piles and boxes just to find that one set of new golf balls, is it? Wall Space: We use the space on your walls to get everything off the floor and in its own spot. Maintenance: With everything having a place keeping your garage organized is easier then ever before. Adaptable: We know your life changes so we made our product versatile to adapt to your needs as they change. With our unique garage storage options, you’ll be able to create the ideal storage area, workspace, home office, or even finish off your garage flooring and create a whole new living space. Garage Shelving: Our shelving is tough, durable, and sturdy, allowing you to store your children’s toys, your tools, and any sports equipment. Garage Cabinets: These cabinets are completely customizable, so you will own a line of cabinets that matches your style. 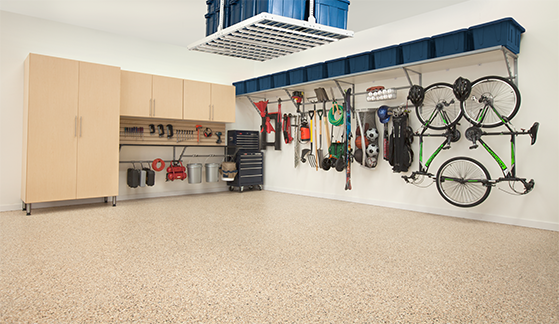 Overhead Garage Storage: Overhead storage is great for long term storage items. Our system is secure, a two inch lip, and more than 40 bolts. Garage Flooring: Use our fantastic floor coating solution to rid your drab, concrete floor of stains and pits and give it a smooth, stain-free, and seamless look.